Begin every day with a smile with your custom set of photo magnets guaranteed to brighten each day. Choose 12 of your favorite photos to customize your set and stick one or more of these charming photo magnets to any metal surface. Perfect pick-me-ups for at home and or the office, our picture magnets look just right at home on your fridge, on the file cabinet at work or wherever metal and magnet meet. 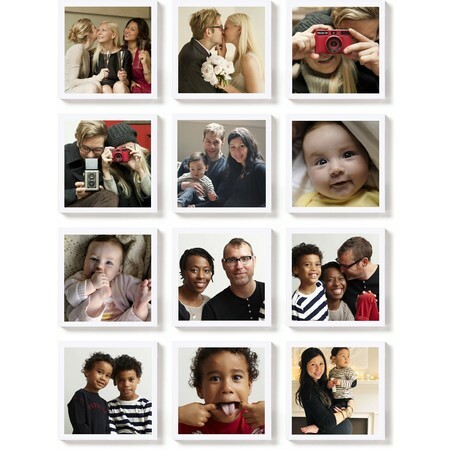 Bring out your creativity with one of our photo magnet sets. Use the 12 photos to tell the story of your wedding. Or, personalize a set to showcase your recent vacation trip. Create an ensemble of photos, such as pictures of your little one, the family, loved ones and pets. Each photo magnet is a 3-inch by 3-inch square and features one of your cherished photos. Photos are printed on luster photo paper for a bright, crisp image. These custom photo magnets are sure to be the main attraction in any room. Wouldn't Grandma love a set of photo magnets, too?